Refer to the Basic Biology page for some general information about turtles and our lone lizard. 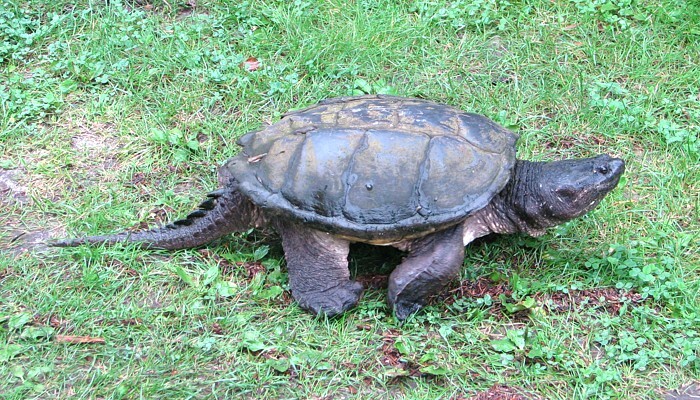 Snapping Turtles were once used by police to locate human drowning victims. Tethered turtles were released into the water and would seek out decaying corpses using their powerful olfactory senses. There are two species of turtles in Manitoba and one lizard. 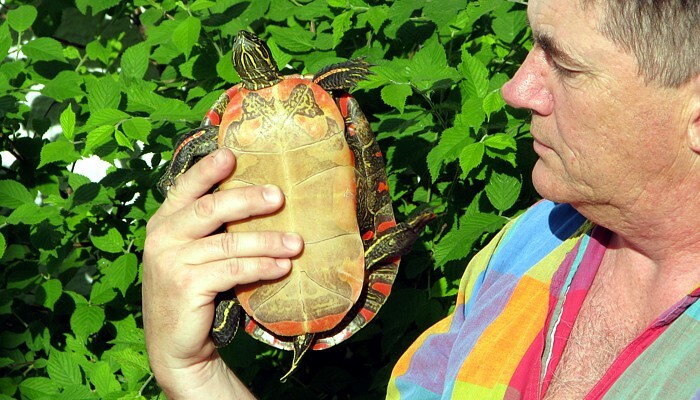 The turtles belong to separate families, the Painted Turtle to the Emydidae and the Snapping Turtle to the Chelydridae. Our lone lizard, the Northern Prairie Skink, belongs to the family, Scincidae. 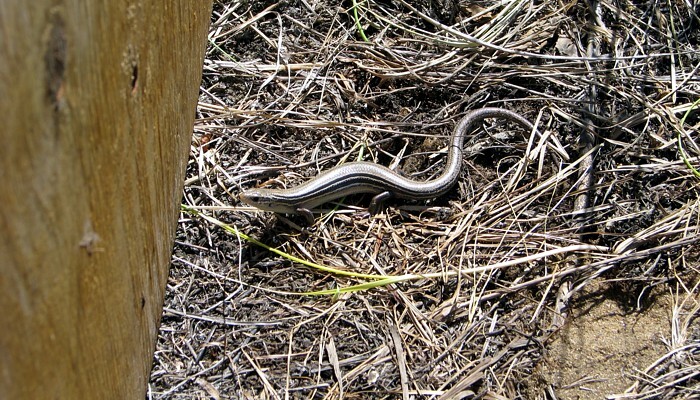 The Northern Prairie Skink is an endangered species and is a priority for this project. Current conservation rankings by the Manitoba Conservation Data Centre are included here. For explanations of the ranking terminology: Click Here. Description: A large turtle, and our largest reptile, growing to a shell length of up to 50 cm, though most adults are closer to 30 cm shell length. Males are larger than females. 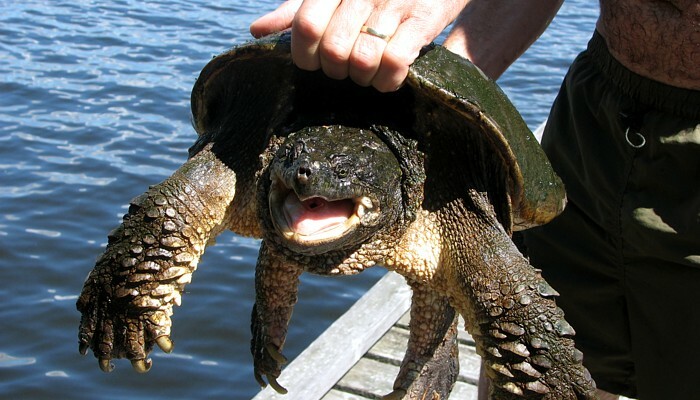 The record weight for a Common Snapping Turtle is 35 kg. 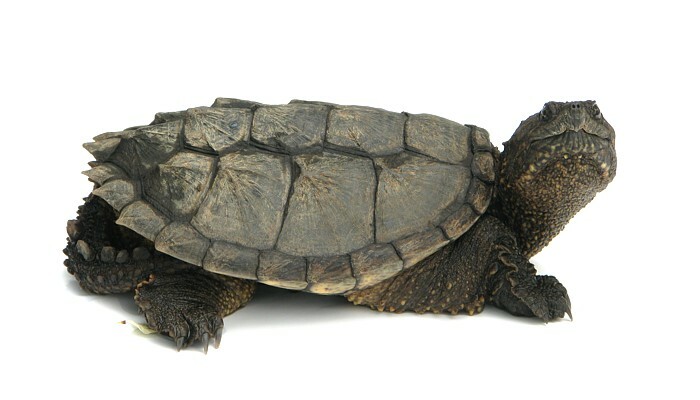 With its long neck and long tail stretched out the total length of a Snapping Turtle can be twice the length of its shell. Colour is dark brown, younger specimens appear nearly black. 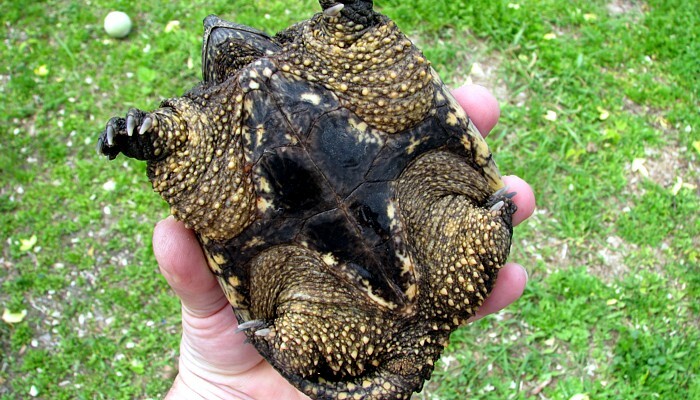 Hatchlings are dark brown to black with prominent white spots or markings on the underside. The dark colour, large head with beak-like mouth, long tail and serrated edge along the rear of the shell distinguish this species from the Painted Turtle. 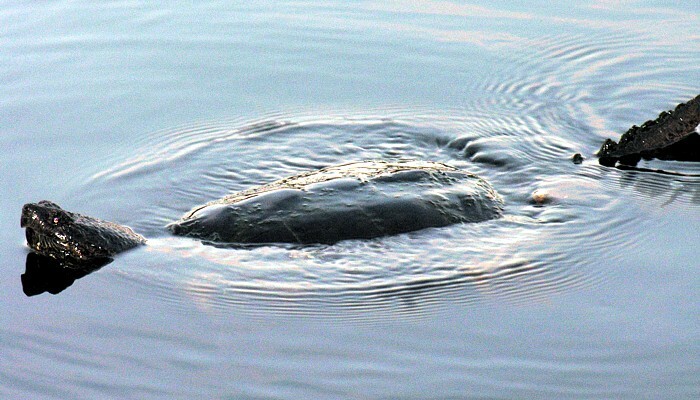 Status and Range in Manitoba: The Common Snapping Turtle is common in southern Manitoba (S3). It is found in the southern third of the province. Current Range Map for the Common Snapping Turtle. Diet: Common Snapping Turtles are omnivores. They eat a wide array of aquatic animals, including fish, amphibians, crayfish, snails and other invertebrates, but also consume aquatic plants and carrion. Small mammals and birds floating on the water surface may be snapped up, too. Tips on finding this species: Common Snapping Turtles can be seen basking along the edges of water bodies. They don't bask as often as Painted Turtles and they may be more difficult to spot than a Painted Turtle, simply because of their darker colour and "rock-like" appearance. They are readily attracted to carrion and can be lured into traps or for close viewing with a dead fish or other meat secured to a line. From late May to early July it is not uncommon to find them crossing roads as they move from one water body to another, or females search for nest sites. 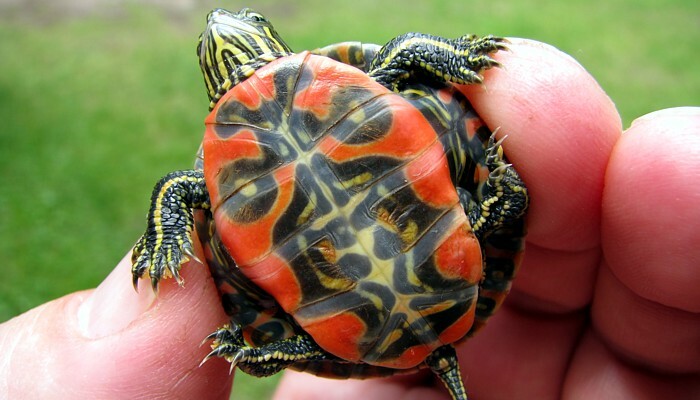 Special Note: The Western Painted Turtle is considered to be a very distinct subspecies of Painted Turtle. It is the largest and most brightly patterned of the various subspecies and the only one that occurs in Manitoba. Description: A medium to large turtle with a shell length of up to 25 cm, though most are much smaller. Females are larger than males. The shell is olive-green to brown on top and cream to reddish with bold patterning on the bottom. Skin on the head and legs is brown to black with bold yellow stripes. 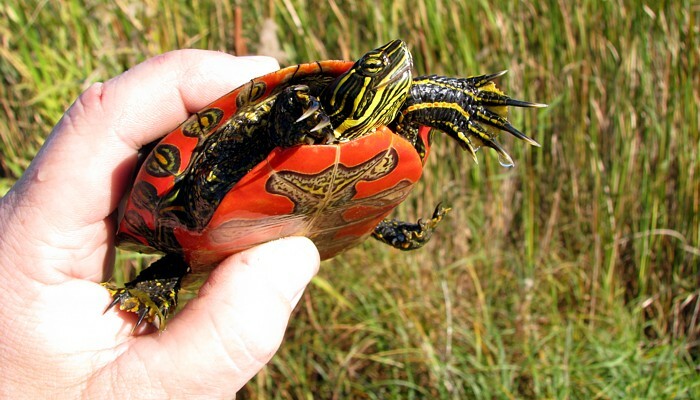 Status and Range in Manitoba: The Painted Turtle is common in the southern third of Manitoba (S4). Current Range Map for the Western Painted Turtle. 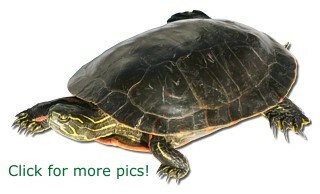 Diet: Painted Turtles are omnivores, but are less predacious than Snapping Turtles. They eat a wide array of aquatic animals, plants and carrion. 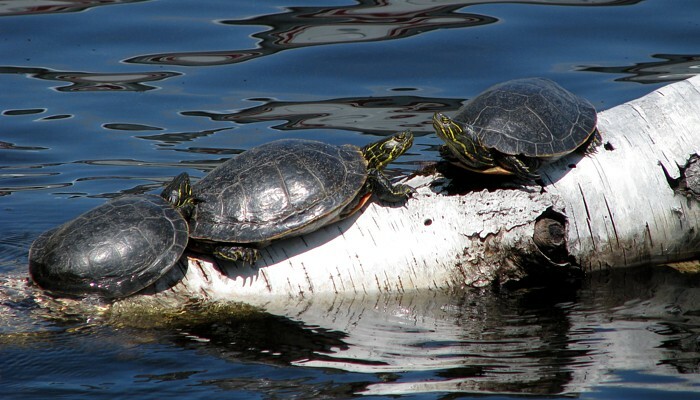 Tips on finding this species: Western Painted Turtles are readily seen basking along the edges of water bodies. They prefer to sun themselves on floating logs, emergent rocks or small islands rather than on the edge of the water body where they might be exposed to predators. Like Snapping Turtles, they are readily attracted to carrion and can be lured into traps or for close viewing with a dead fish or other meat secured to a line. From late May to early July it is not uncommon to find them crossing roads as they move from one water body to another, or females search for nest sites. Special Note: There are distinct northern and southern subspecies of the Prairie Skink. See the Save Our Skinks website in NatureNorth for more information on the Northern Prairie Skink. Description: The Northern Prairie Skink is a small, slender lizard, olive-brown or grayish in colour with alternating light and dark stripes running the length of its body. The belly is light grey. 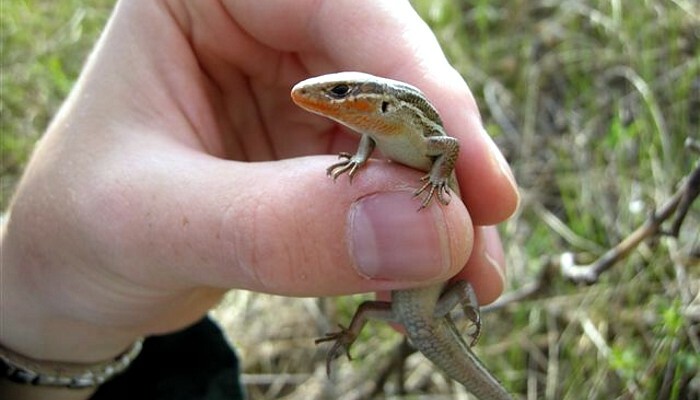 Adult skinks can grow to a length of about 20 cm, head to tail, but half of that length is usually tail. Females tend to be a bit larger than males. 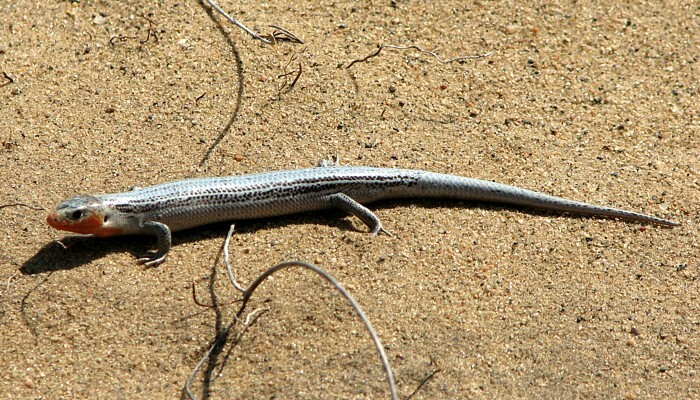 Juvenile skinks have bright blue tails. The blue colour fades as they reach adult size. During the breeding season adult males develop orange colouration on their heads and throats. Habitat: Sparse grasslands in areas of very sandy soils. 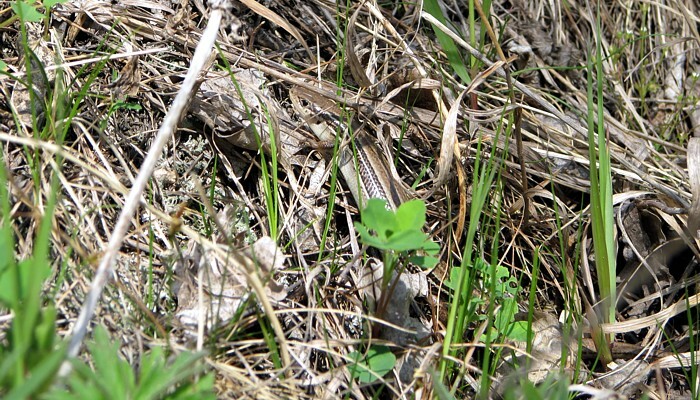 Status and Range in Manitoba: The Northern Prairie Skink is considered rare in Manitoba (S1). Federally it is classed as an Endangered Species. It is found in two regions of southwestern Manitoba. One is a small pocket in the Lauder Sandhills southwest of Brandon. This isolated population is found in a small location, only about 1 ha. 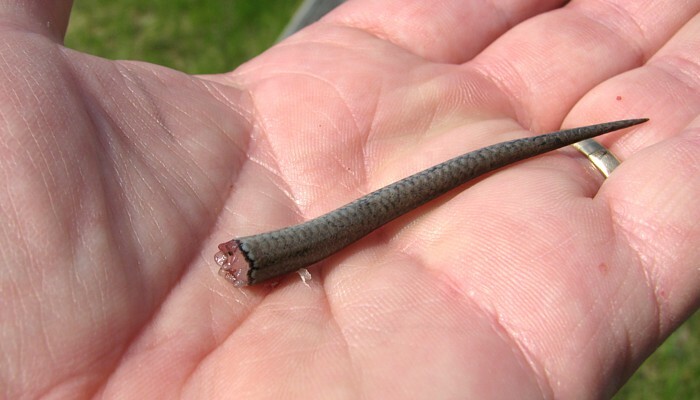 The main skink population occurs within the Assiniboine Delta region, east of Brandon. Current Range Map for the Northern Prairie Skink. Overwintering: Burrows to below the frost line in sandy soils. Diet: Crickets and spiders seem to be their favourite prey, but they will eat grasshoppers and a variety of other insects. Life Cycle: Mating occurs in May or June. 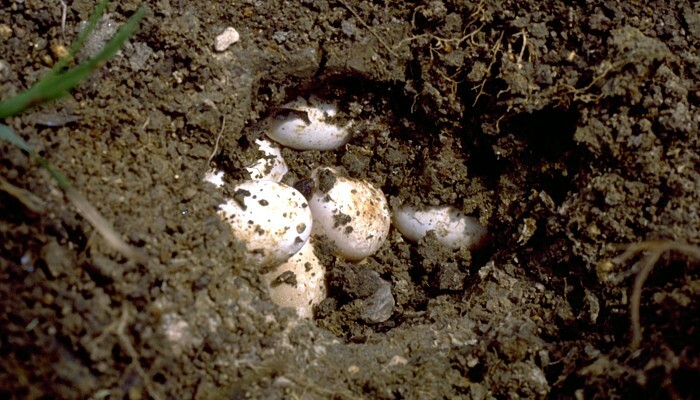 In late June or early July females lay 4 to 18 eggs in shallow nests they dig, usually under some form of cover. The female stays with her eggs until they hatch, in about 30 days, usually in early August. Tips on finding this species: South facing slopes in grassy habitats are the best place to look for Skinks. They may occasionally be encountered as you walk along, but the best way to find them is to look under various forms of cover: branches, logs, rocks, building materials; anything that the skinks can hide under. For more on Skinks see the Save Our Skinks website.